Caption slip reads: "Photographer: Snow. Date: 09-02. Reporter: Adler. Assignment: St. Vibiana. Archbishop J. Francis A. McIntyre with glass and metal case above altar -- with remains of St. Vibiana in case (wax model). 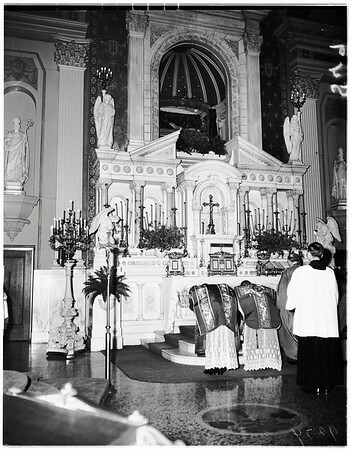 Archbishop J. Francis A. McIntyre in center of other priests in front of altar with glass and metal case and St. Vibiana high above. Father Michael O'Connor on left, with other priests during ritual".